The PM-LPM is a variation of the PM-LP projector mount. 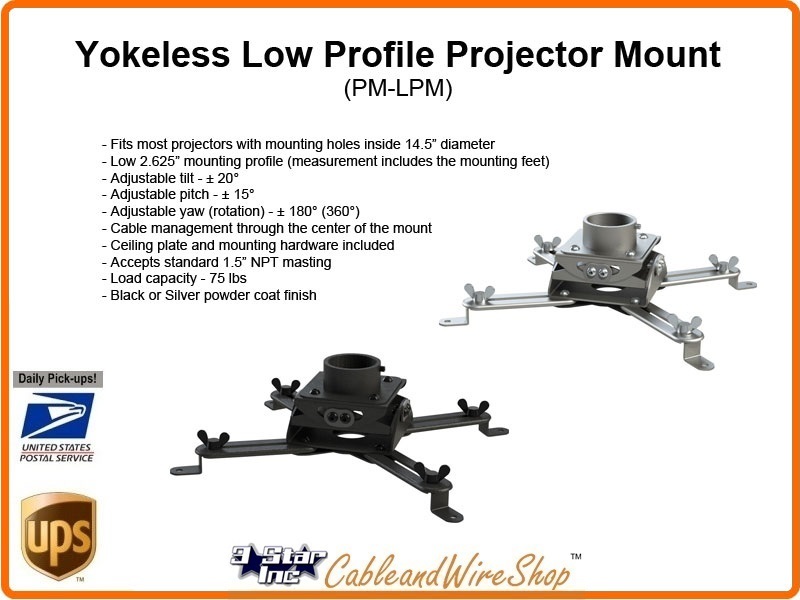 The PM-LPM is a yokeless, low profile projector mount without the Telescopic mast. It does include a universal ceiling plate that can utilize 1.5" NPT masting. It is compliant with most of today's leading projectors, and is available in silver and black powder coat finishes. Cable & Wire Shop's projector mounts are designed for homes, schools and businesses alike. Our mounts are built to last. We stock both fixed and telescoping ceiling mounts in case you need to adjust the height of your projector. We also sell projector boxes with security in mind to protect you against theft and vandalism. In combination with our Projector Mounting Accessories we have all accessories you need to mount a projector to the ceiling. If you have any questions or need help selecting a product, give us a call at 407-944-8856. We are open Monday through Friday 8:00 am - 5:00 pm.